My experience is that humans are very poor at following rules. I think there needs to be some sort of enforcement apparatus set up. Hi! Mistletoe here! My huMom is constantly telling my boy/man to "park these boats in the closet, please". I like the boy/man because he is very generous....and messy...with the treats. If you were a huMom you'd remind Gloman where his shoes are supposed to go. But you're a kitty. So you did what kitties do when they come across unattended shoes. Unless you went in the closet after the shoes? I think I need someone to explain to me why you're the one in handcuffs? you tell him "GLOMAN shoes belong in the closet!" oh oh this calendar is so nice ! Thank you for sharing ! Fab Sunday Katie and Glogirly ! We knew Sparkle's rules would set things right they are so handy, if only we could get the humans to memorize them (sigh). We've voted and wish you all the best lovely Katie!! We LOVED your Accused clip!!! And Wally! LOL! This calendar is a definite must for all humans! Good job, Sparkle! I'm sending M over to order right now. We won the book recently too and it's very good. My dad would most certainly need that calender ! I think the lace did it! 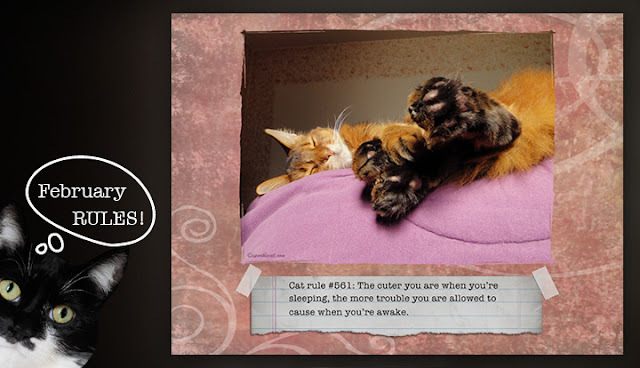 Thanks for reminding me we have to get our Cat Wisdom 101 calendar ready. We'll help you with a last minute push to vote for the undecideds. Oh we agree with Sparkle. Rule 97 clearly states...NO RULES were broken by a certain Black Tux Girl in da house! 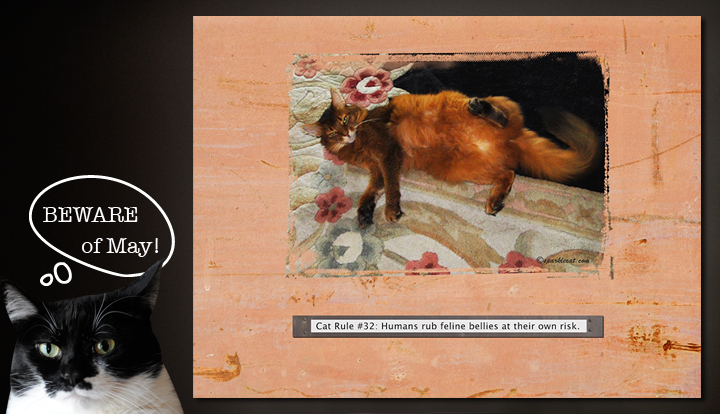 and we KNOWS Sparkle is the smartest cat in the blogosphere! Did I see someone trying to tamper with the jury? Shocking! I object to using that calendar as evidence! My next witness is Sparkle. She will tell us that NO rule was broken and my client must be freed. That looks like the best calendar, for sure. Thanks for that terrific review. Take care. What a great interview with Sparkle. 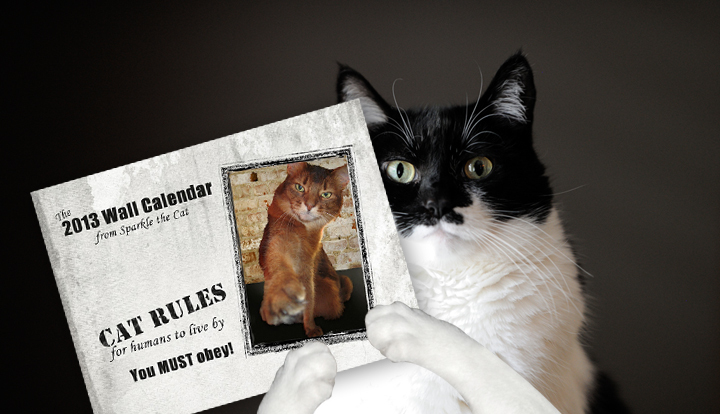 That looks like the sort of calendar we need around here. We wanted to let you know that we voted for your video. Good luck!